Merle Dixon doesn’t do warm and fuzzy. The maniacal gun-slinging racist and nastier of two redneck brothers on AMC’s genre juggernaut, The Walking Dead, Merle achieved cult status last season after sawing off his hand to escape encroaching zombies. Considering his few scenes, the level of demand for Merle’s return surprised both the network and producers, and might not have happened were it not for the humanizing force of actor Michael Rooker. Rooker’s recent presence on the show, in the form of a hallucination, was not only Merle Dixon’s long-awaited reentry, but a stellar example of a network tapping into its characters–and their fans–to promote a series about the undead in a fresh way: Throw out just enough meat to appease appetites, but keep ’em hungry. And Rooker, who playfully dodges questions about his next appearance, dove into the scene with humor-laced swagger and improvisation. Coercing his semi-conscious younger brother, Daryl (Norman Reedus) into climbing a steep ravine to safety, not even Rooker knew everything that would spill out of his mouth. After nearly three decades in films like Henry: Portrait of a Serial Killer, Cliffhanger, JFK, Days of Thunder, and Slither, Rooker watched his popularity explode after a handful of scenes and a disappearing act last season, prompting three fan groups, a videogame gig in Activision’s Call of the Dead, and an AMC promotional campaign that teased his eventual Nov. 13 return. Which hints at the secret ingredient for Dixon devotion. While Rooker’s embodiment of Merle may have created fans, the authentic way he embraced them created a grassroots promotional force. Last April, the Rookerholics crafted a Mo Merle Twitter campaign to bring Merle back, aimed at AMC and Walking Dead producers, and enlisting the help of fellow fan group, the Zombie Survival Crew. Dixon’s Vixens joined them on subsequent Twitter blitzes. 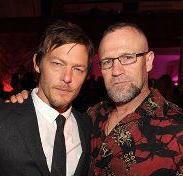 Rooker and Reedus often tweeted shout-outs to each other. “It was a social networking trifecta, all for getting Merle back on the show,” laughs Rooker. Rooker has responded in kind. He joined the Zombie Survival Crew as its head of special forces, created severed polyurethane hands to dole out to fans at conventions, mentioned the groups in interviews, and instigated the idea for the first Rookerholics meeting at the recent Horrorhound Weekend in Cincinnati, where some two dozen members introduced themselves and explained why they were addicted to Rooker. The best story earned a signed zombie-shaped shooting target. The group was so stoked from the experience, it’s now planning campaigns for a Merle Dixon action figure, a Sons of Anarchy guest spot for Rooker (who rides a Harley for real), and a listing in next year’s People’s “Sexiest Men Alive” issue–none of which they bothered to consult Rooker about first.